Make a bold statement on a feature or accent wall with this five-sided decorative ceramic tile. You can explore the design possibilities for this particular pattern by combining different colors and glazes to reveal different repeats on a large or small scale. The Coral is available in one of our 300+ glaze options or we can custom color match. You could also decide to choose the unglazed natural or colored clays depending on your specific project. We can design custom ceramic tiles for interior and exterior use. Our designers can also add hand-painted accents throughout this design to create a unique piece for your particular application. 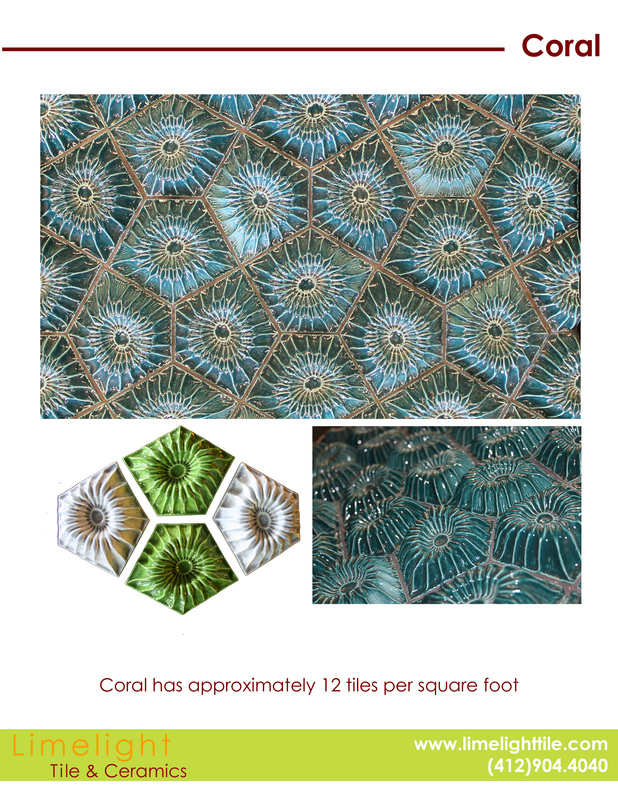 The Coral design has a way of captivating your eye with an illusion, but this pattern is in fact symmetrical and measures 4”x4.75”. When you are searching for custom tiles and ceramics, you can trust Limelight Tile & Ceramics to create and manufacture one-of-a-kind pieces or customize our existing design patterns.